Plastic recycling has become an increasingly important sector of recycling but it would be hard to declare plastic recycling as a success story from an environmental perspective, with less than 10% of generation from the U.S. Municipal solid Waste stream being recycled, as well considering the very serious global challenge of ocean plastic and the enduring environmental problem of plastic shopping bags. It takes up to 500 years to decompose plastic items in landfills. According to EPA, 9.1% of plastic material generated in the U.S. Municipal Solid Waste (MSW) stream was recycled in 2015. Another 15.5% was combusted for energy, while 75.4% was sent to landfills. 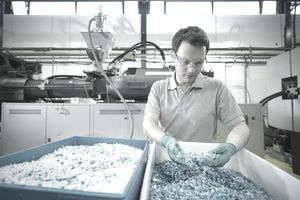 According to the U.S. EPA, plastic recycling results in significant energy savings compared with production of new plastics using virgin material. PlasticsEurope reports that 7.7 million tons of plastics were recycled globally in 2014, including more than 3.5 million tons of post-industrial and post-consumer plastic scrap that were recycled in the United States, according to ISRI estimates. According to NAPCOR, 301.1% of plastic bottles sold in the U.S. were recycled in 2015. The recycling rate of various plastic items such as plastic bags, bottles is slight. According to EPA reports, 2.1 million tons plastic waste was recycled in 2008. This number equals to 6.8 percent of total plastic waste generated in the U.S. in that year. But the recovery of PET soft drink bottles in 2008 was 37 percent which was much better than that of other plastic containers. In 2008, only 13.3 percent of plastic packaging was recycled. And currently, 27 percent of plastic bottles are recycled. Every year, roughly 102.1 billion plastic bags are used by Americans. Every year, 2.4 million tons of PET plastic discarded in the U.S. and 26 percent to 41 percent of this is water bottles. Each year, about 25 million dollars is spent in the state of California to dispose of plastic waste in landfills. The plastic waste that is thrown away into seas every year can kill as many as 1,000,000 sea creatures. Over time, plastic breaks down into tiny particles called micro-plastics, which are found on shorelines around the world. According to the Ellen MacArthur Foundation, there will be more plastic in the ocean than fish by 2050, while researchers believe the amount of ocean plastic will be 10 times greater by 2020. Plos One, a scientific journal, estimates that five trillion pieces of plastic, weighing more than 250,000 metric tons, is afloat in oceans. Also in 2015, U.S exporters shipped more than 2 million tons of plastic scrap, valued at $810 million. According to American Chemistry Council, currently, more than 80 percent Americans have access to different plastic recycling programs. Over 1,600 business organizations in the U.S. are involved in recycling post-consumer plastic items. It costs approximately $4,000 to recycle one ton of plastic bags. But the selling price of these recycled bags is a couple of times more than the cost. 1,000–2,000 gallons of gasoline can be saved by recycling just one ton of plastics. Producing plastic products from recycled plastics reduces energy requirements by 66 percent. Around 2,000 pounds of oil, the amount of water used by one person in two month’s time and two people’s energy consumption for one year can be saved by recycling just one ton of plastic wastes.